PATNA: Investigations into the Maoists attack on the house of a Bihar BJP lawmaker on Saturday night have brought to fore a startling revelation. According to reports, the rebels attacked the lawmaker Rajan Singh’s house and also killed his uncle as he had backed out from his promise of returning the exchanged notes to the rebels after demonetization. 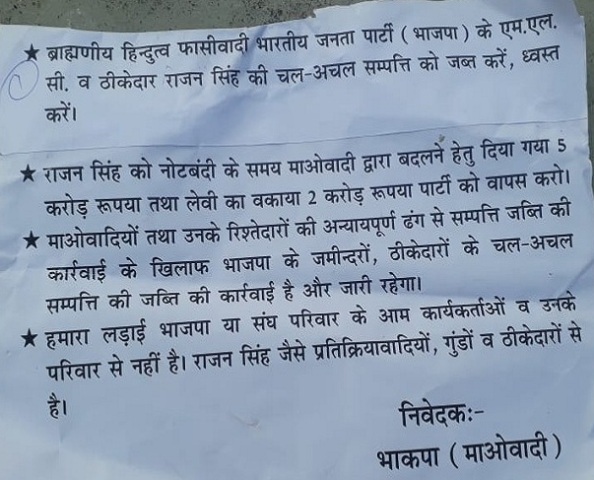 If the contents of pamphlets recovered from the attack site are to be believed, the lawmaker had accepted Rs 5 crore from Maoists promising to convert them into new currency when Narendra Modi government demonetized the high value currency notes in November 2016. But, the lawmaker allegedly failed to return the exchanged cash to the Maoists despite repeated reminders which angered them, ultimately resulting in attacks on former house located at Sudi Bigha under Deo block in Auranagabad district. .
“Rajan Singh must return Rs 5 crore that he accepted to convert (into new currency) from the Maoists and Rs 2 crore on account of levy,” says the printed Maoist pamphlets recovered from the attack site. The pamphlet further states that Maoists’ fight is “not against the BJP or Sangh Parivar but against reactionary forces like Rajan Singh”. The rebels in a massive raids on Saturday night had killed lawmaker’s kin, blasted a community centre at the village and also set afire 10 vehicles, including five buses and four cars. Singh has rubbished the allegations yet they have caused huge embarrassment to the BJP leadership.